Sad when I read someone making fun of job candidate who started out learning web design with Dreamweaver. We all start in different places. I thought I’d take a moment to share the story of how I learned to do web stuff. I know I’m dating myself, but while attending college in the mid-90s, the web was new and exciting. We had no clue what this new Mosaic program was on the computers in the lab.We started to see these very long strings of characters that we could type into that program and it would give us information from around the world. I was hooked. I wanted to make these new “web pages.” But it was 1995-1996, and there weren’t courses in it. I read a little online about how to make pages, but I had no server to share my creations on. One department on campus did possess this power, this magical ability to host web pages: the Math and Computer Science Department at Duquesne University. They had a Sun Sparc server that was setup for their students to create some pages. I wasn’t a Compsci major though – so it took a few passionate emails to faculty members in the department asking, nay, begging, them for an account on their system so I could make web pages. Now that I know a lot more about managing servers, I know that adding a new user takes about 10 seconds, but for me, it was huge. I don’t think I’m exaggerating when I say that small action changed the course of my entire life. I’m serious. I don’t know who the department managed accounts on that server in 1995/6, but thank you, either Dr. Thomas Keagy or Dr. Donald Simon. Success. I had my account. I was ready to make web pages. One challenge stood before me. I had no idea what I was doing. That weekend, my girlfriend and I went one of the malls in Pittsburgh to a bookstore. Remember bookstores? Remember malls? They were all over back then. We were on a mission. I was on the lookout for the holy grail that would help me create web pages. 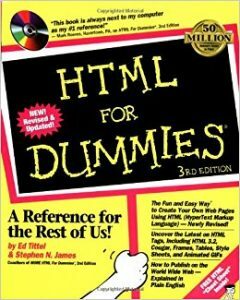 My career in web and marketing literally began that weekend when I bought HTML for Dummies. Yes, HTML For Dummies. This book changed my life. I tore through it in a few days. I was making pages. Making links. Making stuff blink (back when it was still OK to do that.) Tables. Frames. Bold. Italics. Images. Imagemaps. That knowledge led me to get a work-study student job in Duquesne’s New Media Center, making web pages and interactive multimedia projects with faculty. That led me to be hired full-time as the University’s webmaster 3 months before I graduated. That led me to a bunch of jobs in and out of higher ed doing web, marketing, and creative things. 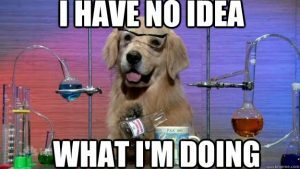 I’ve spoken at conferences, worked at 2 other institutions of higher education, and now work guiding a marketing team that’s spread out around the globe. I owe all that to a simple account on a Math and Computer Science server and a copy of HTML for Dummies. Were the pages I made at first good? Absolutely not, but you have to start somewhere. After getting a pretty good handle on HTML and how it works, I jumped into the world of interactive pages. Once I started my full-time job doing the website at Duquesne, I jumped into Cold Fusion and learned over a weekend how to write code that will query a database, and converted what was a printed, broad-sheet newspaper into an interactive website. 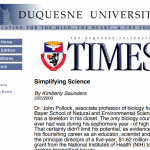 You know what’s great – that Duquesne Times site is still running! It’s moved to WordPress now, but its still a thing! How cool is that – something I started back in 1998 is still going strong. I say all that to say there’s no shame in learning how to do web sites and applications in Dreamweaver, even if I do make fun of my best mate and business partner Adam for using it. If you learned on your own, in school, with a book, watching YouTube videos, it doesn’t matter. You learned it. You are still learning it. The tools have never been better or more accessible. There are undergraduate and graduate programs everywhere, coding bootcamps, online programs, and so much more. Oh, one final thing. The girlfriend who took me to get that book? We got married and our oldest son just finished his first year of high school, where he took a digital marketing and multimedia class this year. It’s all come full circle.